Summer is an ultimate time to relax, go to the beach and party. I haven’t had much opportunity to relax or go to the beach, yet, but in the past month and a half I have hosted and catered five major events, and the one appetizer that has been requested by friends and family each and every time is this walnut stuffed eggplant rollatini. There is definitely something so essentially earthy in the melt in your mouth texture of the eggplant roll that appeals to the palate, because no matter how many rolls I make, and despite everything else that’s served, there is just never enough of these delicious Georgian (country, not the state) style eggplant rollatini. Many of my guests kept asking me for a recipe, and so I have decided to put it up on the blog instead of having to explain the recipe over and over. After all this is the reason for the existence of the blog in the first place. Hope you enjoy this recipe as much as my guests have. Cut the 2 ends off the eggplant. 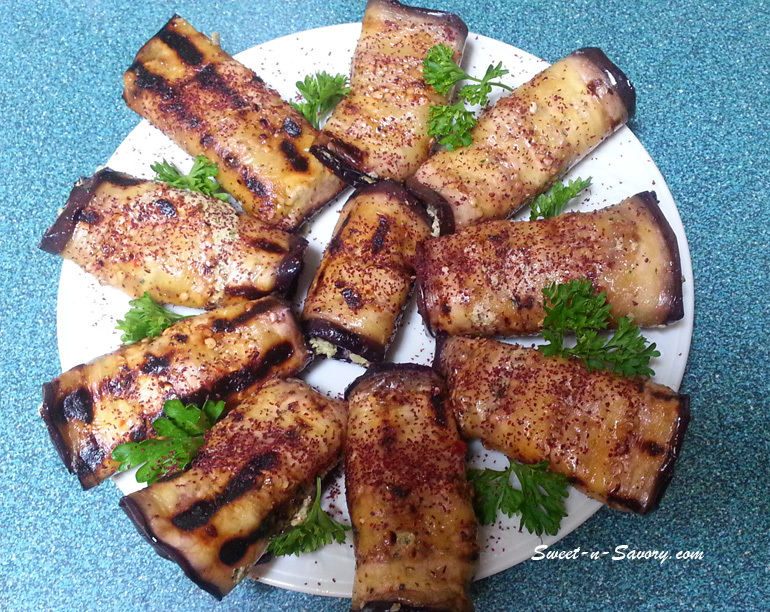 Arrange eggplant slices onto a cutting board, or a rack set over a baking pan. Sprinkle with sea salt to help remove excess moisture and any bitterness from the eggplants. Set aside for about 10 to 15 minutes. 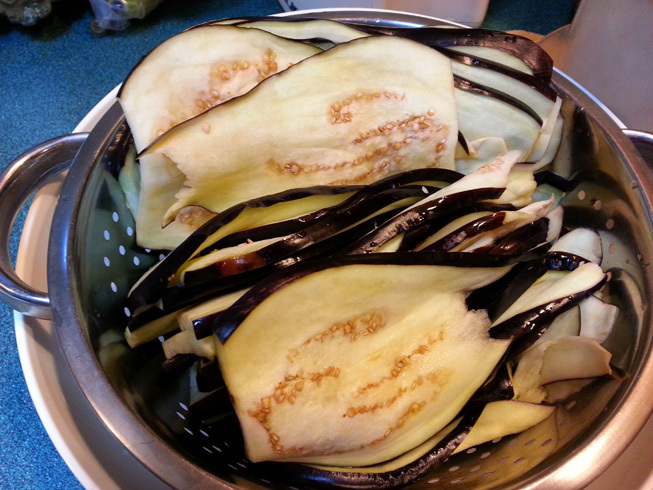 Rinse off the salt from the eggplants and pat dry with a towel. 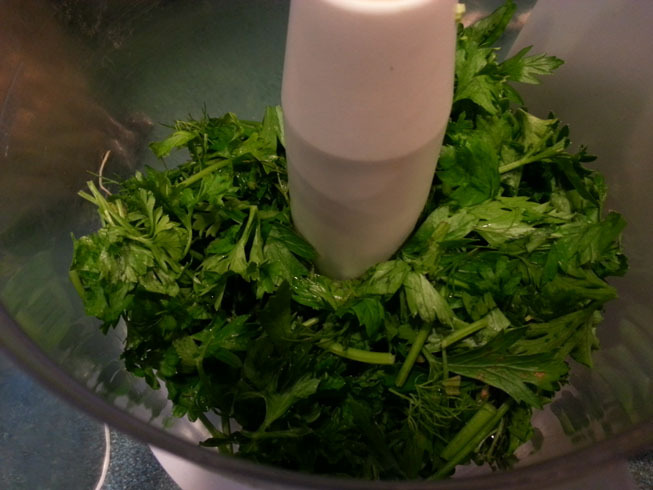 Brush each slice with a little olive oil and sprinkle with an Italian herb mix if using. 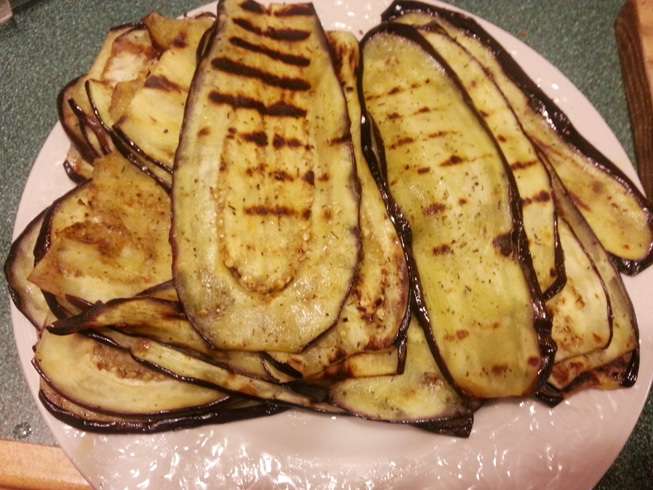 Spray hot grill pan liberally with vegetable spray and then place eggplant slices on the grill until lightly browned on each side and tender, about 4 minutes per side. Remove slices from the grill pan and allow to cool. 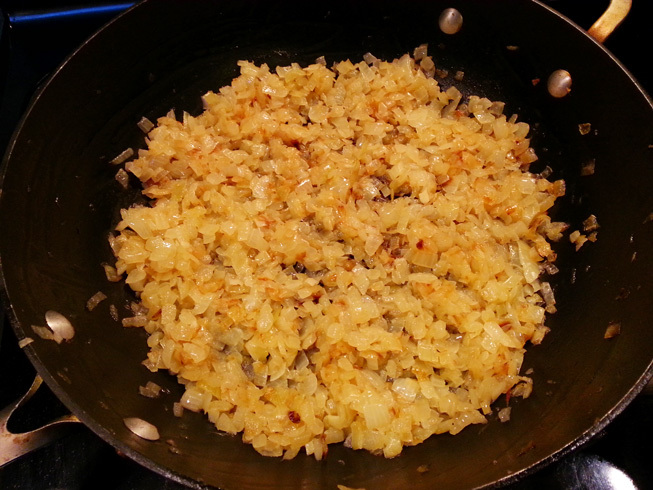 Dice the onions and sautee on medium low heat, until they are translucent and start to turn golden. Cool the onions. 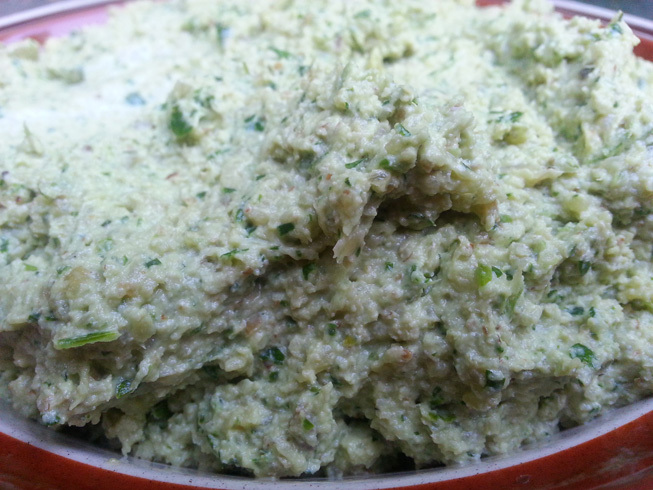 Add onions, walnuts and fresh herbs into a food processor fitted with a blade and pulse until all the ingredients have combined and reach a smooth texture. Turn the mixture into a bowl, add salt, hmeli suneli and mix. 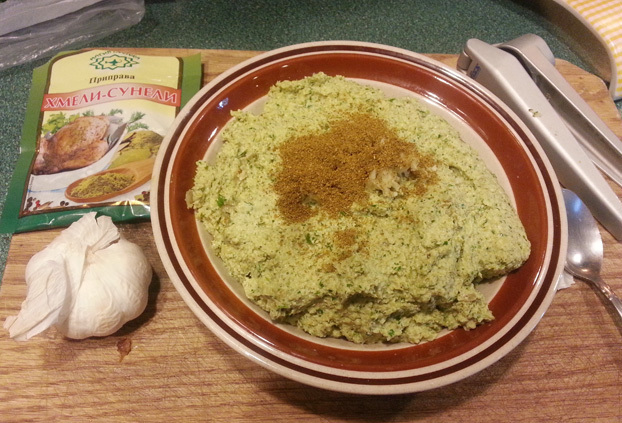 Using a garlic press or a small grate press or grate the garlic. Taste and adjust the seasoning. I recommend adding one clove at a time – you don’t want the garlic to overpower. 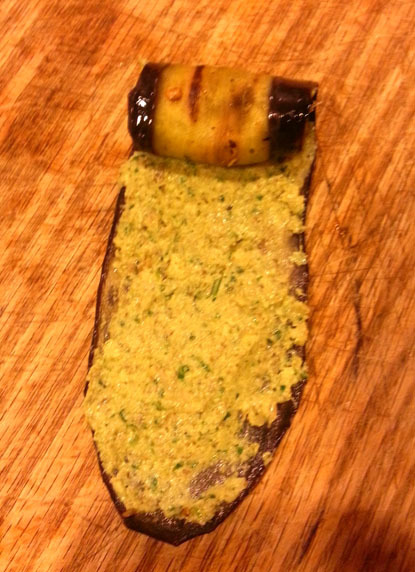 Place a strip of eggplant on a cutting board. 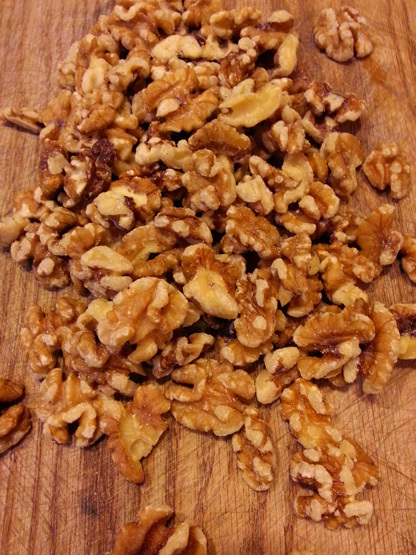 Spread about a teaspoonful of the walnut paste and roll. Arrange on the platter or plates, decorate with pomegranate seeds or sprincle with sumac and Enjoy! Thank you 🙂 They are. It’s delicious, you will like it.